Condolences to Betsy DeVos, a deep lover of education whose request to slash counseling services and programs benefiting students from low-income families was rejected by Congress....for the second year in a row. The Washington Post reports that DeVos sought, unsuccessfully, to divert more than one billion dollars into private school vouchers and school-choice programs and trim the education budget by 5 percent, or $3.6 billion. Her budget gutted after-school programs and college grants for kids from low-income families, slashed resources for the Office of Civil Rights (OCR), and cut mental health services at schools. 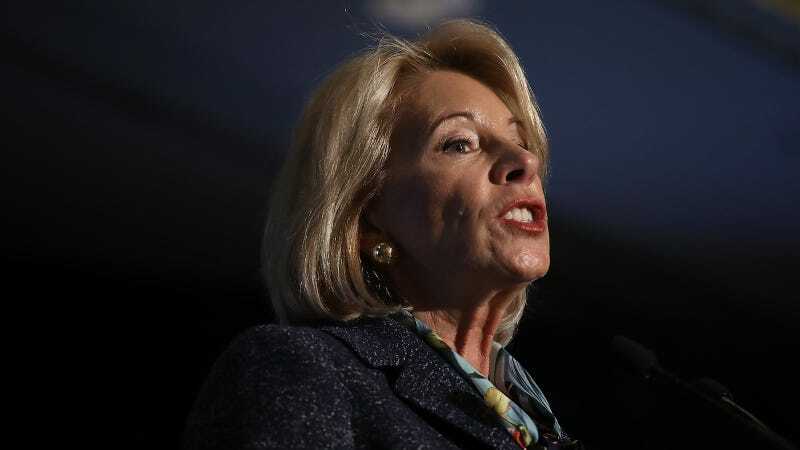 Congress, for once, actually rejected bad policy and denied the proposal, instead injecting $3.9 billion into many of the programs DeVos wanted to cut, including grants in support of student mental health, the OCR, and after-school programs for needy students. Devos’s beloved school choice programs won zero funding. “After more than a year on the job, I would have hoped Secretary DeVos would have learned by now that her extreme ideas to privatize our nation’s public schools and dismantle the Department of Education do not have support among parents or in Congress, but unfortunately that does not seem to be the case,” Washington Sen. Patty Murray, the ranking Democrat on the Health, Education, Labor and Pension Committee, said at Tuesday’s House Appropriations subcommittee hearing. “I am concerned about the administration continuing to request cuts that Congress has rejected,” said Oklahoma Rep. Tom Cole, a Republican.